As tuners and enthusiasts push the limits of the stock ECU in the Nissan GT-R, new tuning solutions have to be found. In the case of the Nissan GT-R, the OEM manifold pressure sensors are limited to 24 psi. For a stock car running 10-13psi, this gives them lots of headroom. For a 1100 whp GT-R running 37 psi, they are unable to accurately give proper feedback for boost control,and for proper boost logging. 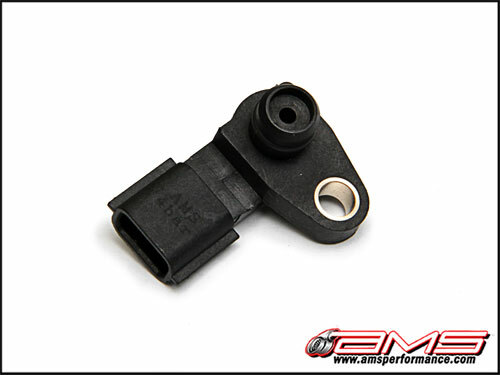 The AMS Alpha MAP Sensor is a solid, plug and play solution for precise boost control over 24 psi. Following the success of the Alpha MAF Sensor Upgrade, the first on the market to solve drivability problems for high hp GTR’s, we quickly found it necessary to upgrade the MAP sensor for the R35 GTR. We noted that higher boost levels created inaccurate boost control with the R35 GT-R and we needed a bullet proof solution. What's The Problem With The Factory MAP Sensor? The factory MAP sensor only reads to 24 psi reliably which leaves very little room to have a working boost cut in case of an over-boost situation. The factory boost control is also pressure based so after 24 psi there is no longer any ‘control’. The boost will run whatever it wants to in relation to air temperature and density for that day. There is also no way to log or tell how much boost a car is running when it is over this limit currently. AMS now brings you a simple solution for reliable and precise boost control with a simple, seamless integration into your GT-R. By utilizing a 4-bar sensor we were able to regain control of the boost accurately up to 44 psi. This will not only give you regained control over boost but allows for better data collection for the Tuner resulting in a more accurate and safer tune on the dyno. Every set of Alpha MAP Sensors includes the necessary calibration parameters and tuning tips which will allow for plug and play installation without a lot of guess work for the tuner. Installation requires no cutting of wiring because it has the same stock connector to plug right into the factory harness. The AMS Alpha MAP Sensors will work with the stock ECU or any aftermarket engine management system available. * No need to cut into your vehicle harness! Connector is the same as factory!